Dating back to the 15th century, this historical villa has been recently restored and refurbished from top to bottom. Its hilltop position ensures superlative views of Florence and the Tuscan countryside, with the city center just a 10 minutes drive away by car or 20 minutes by bus. Villa Tantafera boasts a large indoor heated whirlpool (about 80 x 120 inches), as well as a new dipping pool we created in one of the garden terraces. Not a standard swimming pool but rather an enjoyable large outdoor jacuzzi-like pool (160 x 150 inches) with a great view of Florence. The Villa is nestled on top of 5 acres of private land, scattered with olive trees. All around the house, a terraced garden with ponds and fountains, lemon plants and persimmon trees. Large, high ceiling entrance hall/living room with fireplace, guest bathroom, second living room with fireplace, large frescoed dining room with table for 12, spacious fully equipped kitchen(four burner gas pro-grade stove, double conventional oven, microwave/grill oven, dishwasher, large refrigerator, separate deep freezer) with island counter and stools, connecting to the rear garden. Bedroom #1 : Queen size A/C bedroom with en suite bathroom with tub. Bedroom #2 : Queen size A/C bedroom with en suite bathroom with tub. Bedroom #4 : Queen size A/C bedroom. A large suite with A/C living area and Kitchenette. Double basin bathroom with shower for exclusive use of the Queen size A/C bedroom in the tower. Bedroom#5: Twin beds with en suite bathroom with separate shower. The old cellars have been adapted to accommodate the wellness area, with a luxurious 3x2 meters built-in whirlpool. Please note that, thanks to a unique policy that sets us apart, we ALSO INCLUDE a 3 hours daily maid service (except Saturdays & Sundays). - a Chef that would prepare lunch/dinners or organise cooking classes. - Private driver for airport/train station transfers, as well as day trips to surrounding cities and sites. - Customised tours and cultural visits, with access to monuments and sites not normally or easily available for visits. - In residence personal trainer (yoga, pilates, general fitness) and / or massage. - Personal shopper for assistance and easier access to major outlets brands, boutiques and workshops. - Personal visits to prestigious wineries of Chianti Classico and Brunello Montalcino, tasting tours by the owners winemakers. Everybody deserves a villa in Tuscany! Whether your interests are art, culture, shopping, excellent cuisine or just lounging around a pool, make this charming and comfortable villa your base to enjoy and explore Florence and the many other cities and places of interest in Tuscany. Old time charm with modern facilities to enjoy the Tuscan countryside, with Florence city center just a 10 minutes drive away. A brand new dipping pool created in one of the garden terraces. Not a standard swimming pool but rather an enjoyable large outdoor jacuzzi-like pool with a great view of Florence. A large indoor whirlpool (about 80 x 120 inches), heated and with a salt (no chlorine) filter, allowing guests to enjoy it for as long as they want with no unpleasant dermatological side effects. We had our wedding at Villa tantafera and it was perfect. The house is beautiful and spacious and the views and gardens are picturesque. Best day of our lives! 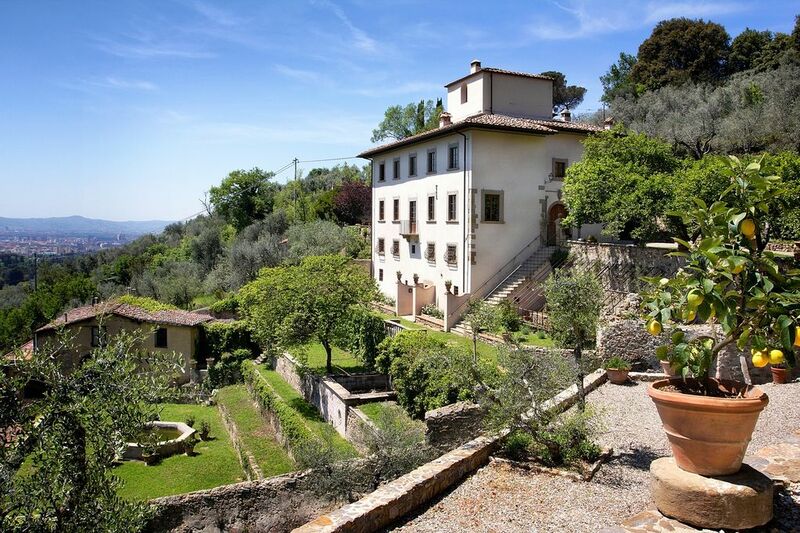 Memorable and wonderful - countryside luxury so close to Florence! We had a wonderful stay at Villa Tantafera last week. We were a party of 8 and everyone had their own bedroom, spread across the many floors of this fantastic estate. Roberto is an exceptional owner who knows exactly how to welcome and help guests with just the right amount of attention. The kitchen was carefully curated with all the appropriate Italian necessities (cheese, breads, meats, tomatoes, wine) to get us started. Roberto provided us information on private chefs (Graziella) and drivers (Giuseppe), both of which we used. Highly recommend having someone cook at home so you can enjoy these amazing surroundings! Giuseppe took us on a day-long wine tour that was the most memorable part of our trip. Not to be missed! You can’t really walk to anything from this villa, so using a driver is helpful and eliminates hassle. Even though we had two cars with us, we only used them for countryside excursions. Highly recommend! A wonderful place to stay. Close enough to Florence to drive in easily every day if you want but far enough to feel away from it all. Villa itself is fantastic. Modern luxury mixed with the original feel of the place. The villa is separated so that every room is extremely private. Hosts were wonderful as well. Very highly recommended. We had such an amazing time at the villa. Everything was clean and the villa was in such great condition. Obviously very well taken care of. The location was exactly what we as a group of six were looking for. Close to the center of Florence ( about a 20 minute drive) yet removed from the bustle. Quiet with views over the city. Gorgeous gardens with old growth olive groves. Stunning surroundings! Roberto is just the nicest and most helpful guy one could meet. He is very proud of his property and it shows. He was very accessible by text or e-mail during our stay. We will definitely be back! And we will be recommending this villa to friends and family! This house was amazing to stay in. The views were truly something. We had a wonderful week at Villa Tantafera in September where we were celebrating combined 40th, 50th & 60th birthdays. From the first minute to the last, it was just amazing and our host Roberto was unstinting in ensuring our stay was the best it could be. He has done a beautiful job restoring the villa and grounds and we hardly wanted to leave to go in to see Florence. There is just something magical about this place and every one of us is trying to think of ways how we can manage to have another week there in future. Out of five weeks in Italy this week was definitely the highlight! The Villa ensures superlative views of Florence and the Tuscan countryside, with Florence city center just a 10 minutes drive away by car or 20 minutes by bus. Longer term rentals rates upon application Utilities (water, gas and electricity) included ONLY with weekly rate.